Recently, I took as stay-cation (that’s cute slang for “we didn’t go anywhere exotic or far from home”) with my husband and son. This was supposed to be a relaxing time where we all hung out, swam in the pool, skipped the housework and generally just enjoyed each other in a way that we usually don’t have time to do. Little did I know… one day of our stay-cation was going to challenge me more I’ve been challenged in the past ten years! “Mom! 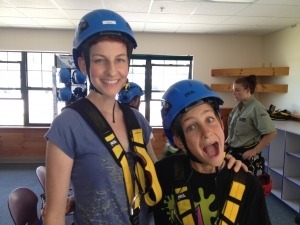 Let’s go zip-lining!” my son enthusiastically screamed from the back seat of the car. We had just passed a huge billboard with a picture of a smiling teenager hanging from a rope high above what looked like teeny, tiny trees below. “Sure, Cole. Of course we can do that during our vacation some time…” I answered. Basically, I knew that we had made lots of plans for our seven days at home together and I was sure this would be one of those that just never came to fruition. I was banking on that. Cut to an anxiety ridden three days later and we’re actually driving up to New Hampshire to the brand new zip line course that has been installed on Mount Sunapee. “You OK?” my husband glanced at me as he put his hand on my knee. He knew that I really didn’t like physical challenges – much less, physical challenges that had anything to do with being up way high or not being able to back out at any moment. “Oh yeah, I’m fine. I’m just going to take a nap, ” I said as I leaned my head on the window to my right and desperately tried to relax my breathing. In the past (fifteen years ago) I’ve been known to hyperventilate and almost pass out. I tried to keep the memory of that at bay. I started counting yellow cars. I asked myself why I had ever said I would do this… Regardless of whether or not it was going to come to fruition, I really never should have agreed to go, I told myself. Finally, after a chair lift ride up the mountain in which I panicked and tried to call everyone I know via my cell phone as a distraction technique (keep looking at your phone, I told myself – don’t look down! ), I found my husband Kevin, my son Cole, two college students, two twelve year old girls and two very stinky (don’t they shower on the mountain?) “guides” along with myself atop the first platform ready to go. This was it. I was either going to do it here – or I would have to get myself back down the mountain via some other method (which would be what… running? Walking? Sledding down the grass?). After the two college girls went and girl-squealed (for the benefit of the stinky male guide I assume) from one platform to the other it was my turn. I just felt like I needed to get it over with. “Alright, Danielle here you go!” the female (and most smelly) guide sang as she clipped me on to the long, LONG line. Silence. I could feel the eyes of everyone who hadn’t gone yet on my back. I could feel my son – NEEDING me to go so that he could feel safe himself. After all, in his eyes his Dad is the thrill seeker. His Dad is the skateboarder, the P90x-er, the surfer, and I’m the lovey-dovey one who meets all his emotional needs but never gets in the pool. I certainly have never been out there proving the strength of my will and my body through thrill seeking. Then, I thought about how much I used to push myself physically. I was the captain of my track team, I did women’s Ice Hockey in high school (OK I didn’t love that, but it’s physical! ), I’ve run long distance, hurdles, I’ve even done one season of P90x… but this was different. I had to trust. I had to have faith. And this is what I had been worried about for the three days since we had decided to really make this happen. I checked my intuition – I “felt” like everything was going to be fine. Not like I hadn’t checked my intuition nine zillion times about this over the past few days – but the message never changed. It was always “Go for it Danielle!” and I knew I needed to do this to show Cole, my eleven year old baby, how far you can go in life when you had trust. But did I really have trust? Over the years, many of you have heard me say “worrying about the future will get you nowhere” and most of the time I’m able to adhere to that. I love that I’ve so often been able to master that lesson (notice that I said “so often”). And this experience was an example of why NOT living is the moment is NOT something I want to do again. The worry, the fear, the anticipation, the sleepless nights… they made the experience so much harder! I kept referring back to the fear of falling, the fear I’d come up with that I wouldn’t be able to get down once I started… all of these thoughts I had concocted over the past three days. They only held me back. Luckily, with that last step, all of those fears flew right out the window! I would have reacted very similarly to you, though I’m not sure that I would have felt vindicated or fulfilled even if I had made that last step. 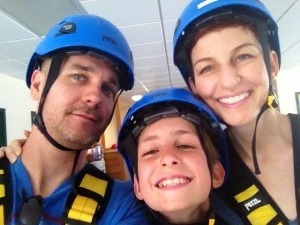 I would not have felt the need to prove to my children that I was game enough to tackle physical challenges when I was very uncomfortable about it. Tao says that someone who takes risks with their own life would have no problem putting others at risk. I definitely separate my physical and spiritual life as far as challenges go. I am willing to go to ultimate lengths to make progress spiritually, however. None of this is meant as criticism, it’s just my feeling. inspired me to do some serious thinking. Thank you for that. I might have gladly given up my space to the next in line! But not you. You faced your fear and did it anyway. This little jaunt above the trees really placed light on that aspect of yourself that was kickin’ and screamin’ and tryin’ to keep you small. So, what’s next? Perhaps, strappin’ a rope to your ankles and jumpin’ off a ginormous bridge??? Or maybe jumpin’ out of a teeny plane at 10,000 feet??? Oh, boy! I can’t wait to read all about it! This is awesome! I just wrote virtually the same story in my journal except with a tightrope instead of a zip line. Thank you for sharing your experience. Congratulations on stepping outside of your comfort zone & facing your fear! I did ziplining as part of a one day “Outward Bound” type requirement in graduate school and, like you, I thought they were CRAZY. However the actual experience was so much fun that I wanted to go again – but they wouldn’t let me 🙂 Much like rollercoasters – the first time is terrifying but once you “know what it is” you could do it a million times. It’s that old fear of the unknown, I guess! I have lived with 3 athletic guys for years, my husband & 2 (now adult)sons. While in Costa Rica a few years back, they signed up for “the big one”…an over the canopy zip line & the kind of safety concerns that we are used to experiencing in this country are often just not there…rickety ladders w/o railings, that sort of thing. It was assumed that I would not go: the heights, the speed, the fear factor! At the last minute, I walked up to the counter & asked the attendant, a young woman, if I would survive & added myself to the ticket price. my family just gawked at me. I said do not say a word & focused on getting the scant equipment on, staying current. The guides looked at me like I was a ghost so I must have had contained fear all over my face! I stepped off into what seemed like air miles above the treetops & screamed, awkwardly arriving on the far platform, ready for the next section. I was so proud of myself & the fun & the high lifted me for days, weeks! I am still proud of it. I can so relate, Danielle! My sons did not believe that I had done it. Good for you, Danielle, what can be better the feeling that you CAN overcome some fears and just make your self DO it.. I never liked the heights, did not fear them, but just had some discomfort about it… My birthday present from my boyfriend was a total surprise for me: ZipLining at Camino Island in WA. He did not tell me about what it will be until last moment, just said to dress sporty : ) That was amazing and did I scream? Oh yes, really loud and loved every minute! !Air into my face, smell of greens, speed.. Best birthday present I have ever had! !